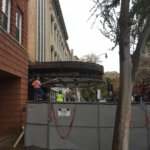 You may have noted some excitement on the 700 block of Broad Street this week. 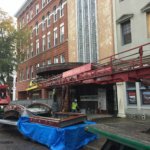 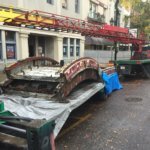 As part of the rehabilitation of the Miller Theater, its historic marquee is being removed for restoration. 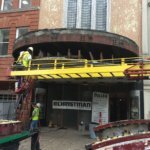 Under the direction of the Miller’s general contractor, The Christman Company, the Wagner Electric Sign Company of Elyria, Ohio, is responsible for the marquee’s facelift. 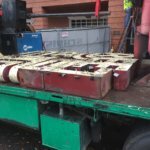 Wagner, which has restored historic theater signage throughout the United States, will take the marquee to its home office in Ohio and return it to Augusta in a few months. 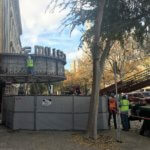 Thanks in part to a generous grant from the Watson Brown Foundation, the Miller marquee will be repaired and relit for the theater’s reopening next year.